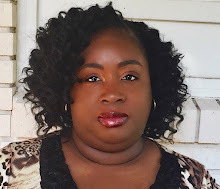 Hello Everyone, and welcome to my stop in the Operation Write Home Memorial Day Weekend Blog Hop. I hope you guys are all getting some great inspiration throughout the hop today. 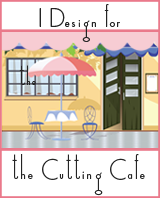 For my card, I used OWH sketch #165 and some awesome stamps from Inspired Stamps. I used Hymn Girls: March stamp set as well as More Perfect Sentiments stamp set from the Inspired Stamp set store. 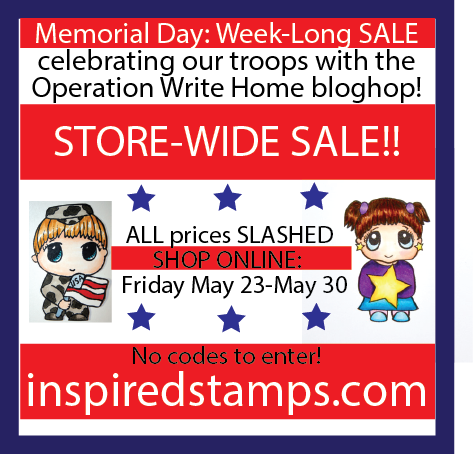 I am on the Inspired Stamps design team so please click on the sale photo below to go get some goodies on sale all week long!! Have a blessed week!! Very cute! Love the Hymn girls! Super cute, love the little girl. What a sweet card! The focal image is too adorable! This is a really cute card - love that image, which I've not seen before today. Thanks for the inspiration! Love the sweet girl and sentiment on this card! Cute idea to use paper piecing on this. That little girl is so sweet. Truly heart tugging. I guess I'm going to have to try paper piecing, yours is great. Very sweet! Love the layers! What a sweet Hymn girl image. I love the papers you chose to go with this card too. Piecing worked out fantastically! love the music paperpiecing -- I will have to give this a go! So cute, I love that little girl stamp! The scallop layers make the card pop! Especially like the layering and scalloped trim. Wonderful card! It's so nice to have the Inspired Stamps DT hopping with us today. Thanks for joining in and supporting OWH! I had never heard of the stamp company until today - perfect for OWH cards. TFS. Hadn't seen the hymn girls before today but am really liking them. Those Hymn girls are so pretty. Thanks for sharing. Cute, CAS! Thanks for sharing! Sweet card! Thanks for your support of OWH!!! That little hymn girl is so sweet. Your kind sentiment is perfect for our heroes. Love this sweet card with the hymn girl! Very sweet stamp and just the perfect sentiment for OWH. Lovely card. Love the hymn girl. Love the focal and the border punch. Thanks for supporting OWH. I am so in love with this image! Great card - thanks so much for sharing! Love the sketch and sentiment...clean and simple is always so nice. Thanks for sharing. What a sweet little image! I love the beautiful red punched border with the blue background. I especially like that the sentiment is in 2 places! Great job - thanks for sharing! Thanks for supporting Operation Write Home and for sharing that adorable card with us - the hymn girl is just so sweet. Wonderful card, love the sentiment! This is my first introduction to Hymn Girls and I love them! What a sweet card! Your little Hymn Girl is a charmer. Looks like your background paper is velvet-- pretty! So sweet with that adorable little girl. Beautiful. I love the cute image. I love how CAS this card is...I also really like the hymn girl. Very sweet--I like the red border. The layers are very nice. This is so pretty! Your clean & simple background colors really make Hymn Girl pop as a focal point! I love the Hymn Girls and in fact used one for my card, too! Thanks for supporting OWH! Great card and thanks for the info about the sale and the link. I'd not heard of Inspired Stamps til this hop and I love what I've seen. Thanks for being a hop stop. She's lovely. I went to the store and saw several things girls and the sailor that are now on my wish list! Thank you for sharing your card. Thanks for sharing the info about the stamp you used. Nice touch paper piecing that image with the sheet music paper ! I had never heard of the. Hymn girls until this hop...but they are so cute , thanks for sharing. That's a peaceful image for an AnyHero card. Nicely done! Thanks for supporting OWH!